Retroperitoneal hemorrhage (RPH), the most feared complication of transfemoral access for endovascular procedures, occurs in 0.1-0.7% of cases and is associated with a 10% mortality rate. Traditionally, a surgical consult and expectant management with transfusion (required in 70-80% of cases) were the mainstays of treatment. Recently, the availability of a 24-hour angiography suite and peripheral vascular operators have changed the standard practice at many institutions, though data are limited to small cohort series and case reports. A case presented below will be used to provide context for a brief discussion following. A 51-year-old gentleman with a history of obesity, sleep apnea and hypertension presented with chest pain since lifting a heavy object on the morning of presentation. His initial troponin was 10, and he was taken for cardiac catheterization after loading with aspirin 162 mg, clopidogrel 600 mg and heparin IV bolus. 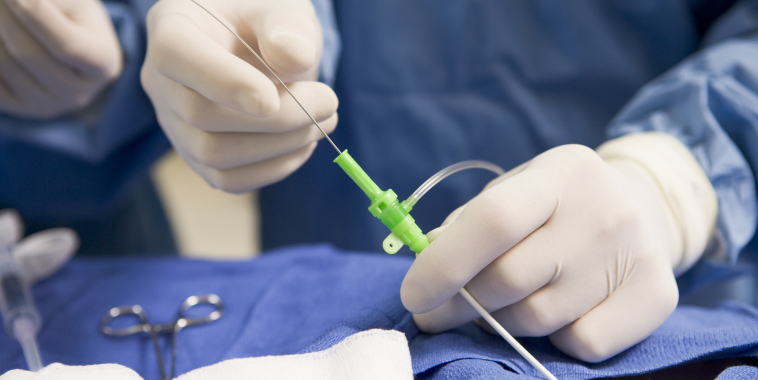 Culprit right coronary intervention was performed via the radial approach. The patient returned two days later for drug-eluting stent placement to a severe stenosis in the proximal left anterior descending artery from the right femoral artery. Prior to insertion of a 6F Angio-Seal VIP closure device (St Jude Medical, St Paul, MN), injection of contrast through the common femoral sheath revealed a “high stick” (Fig 1).Bivalirudin gtt was running during the procedure and was discontinued before the patient returned to the floor. Less than an hour later, the patient complained of sudden, severe right-sided abdominal pain and nausea. The systolic blood pressure dropped to 65 and he was pale and diaphoretic. CT scan confirmed a 17×13 cm retroperitoneal hematoma. Emergent angiography of the right iliofemoral system from a contralateral approach revealed a source for bleed (Fig 2). An 8×38 mm balloon expandable iCAST covered stent (Atrium, Hudson, NH) was deployed over the perforation (Fig 3) with an excellent result (Fig 4). The patient spent one night in the ICU for close observation and was discharged to home two days later. In patients with bleeding disorders, kidney disease or those on chronic anticoagulation, the index of suspicion of spontaneous RPH should be higher. Retroperitoneal hematoma should be considered in any patient that is hemodynamically unstable after a transfemoral procedure. The first step to making the diagnosis is a quick non-contrast CT abdomen / pelvis, which may show soft tissue density compressing adjacent structures. It should be noted, however, that if a patient is post-procedure and unstable the right place to go is back to the cath lab, and not to the CT suite. Going to the CT suite may result in loss of precious time. Once the presence of hematoma is confirmed by CT, the patient should be taken immediately to the endovascular suite for localization and treatment of the source of bleeding (as in the clinical vignette). Alternatively, any patient showing signs of a retroperitoneal hematoma while still on the cath table should undergo femoral angiography at the access sitePerforations can be managed with close observation (as in Appendix – Clinical Vignette) or immediate contralateral access and intervention. Options for endovascular repair are covered stent (for iliac or femoral arteries) or coil embolization (for small vessel perforations). In emergencies, it is best to use whichever of these techniques is most readily available and familiar. Important considerations for stent graft placement include oversizing by 1-2 mm to ensure sealing, avoiding the common femoral bifurcation and preparing for balloon occlusion in the common iliac if difficulties are encountered, leading to a prolonged procedure in a rapidly decompensating patient. When embolization is chosen, coils should be deployed on both sides of a perforation to prevent re-bleeding from dissection propagation or distal retrograde flow via abdominal collaterals. Surgery may be necessary in cases where endovascular therapy fails and bleeding continues despite intervention. In these cases, direct visualization and ligation of the bleeding artery may be necessary, with abdominal packing to prevent ongoing hemorrhage. Abdominal compartment syndrome can develop as the result of a large hematoma. Early surgery (i.e. before trial of conservative treatment, followed by angiography and intervention if necessary) is frowned upon, as removing a retroperitoneal hematoma may relieve tamponade and exacerbate bleeding. It may also be difficult to localize the source of bleeding in the operating room, whereas in the angiography (or hybrid) suite a perforation may be more readily visualized.